Late architect Jon Condoret’s favorite project will be open to the public for the first time. March 20, 2013 (Durham, NC) – Triangle Modernist Houses (TMH), the award-winning non-profit organization dedicated to documenting, preserving, and promoting Modernist residential architecture, will host a tour of the unusual 1973 Arthur and Florence Larson Residence in Durham on Saturday, April 13, from 9 a.m. to 12 noon. 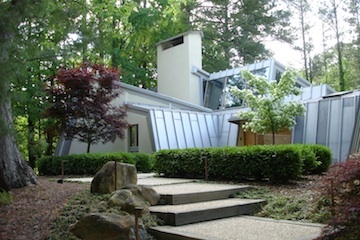 Originally designed by the late Chapel Hill architect Jon Condoret, the Larson home began at 4825 square feet. 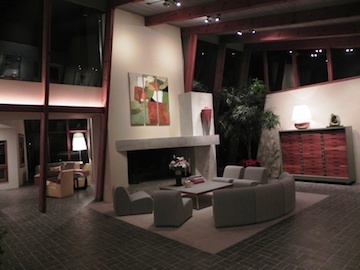 When the Larsons sold the house, the new owners engaged California architect Fu-Tung Chung to design the renovation, which was built by Landmark Renovation with the late landscape architect, Judy Harmon, designing an entrance path and garden. A further 2011 addition expanded the house to 6040 square feet. According to the Durham Herald-Sun’s 1993 obituary, Arthur Larson joined the Duke faculty in 1958 and became only the second James R. Duke professor of law after having served as Undersecretary of Labor, Director of the U.S. Information Agency, and as special assistant in charge of speeches for President Dwight E. Eisenhower. He also served as consultant on international affairs to President Lyndon B. Johnson, the U.S. State Department, and the United Nations. While the Larsons lived in their Modernist home, they frequently entertained friends and fellow Duke Faculty, often holding classical music concerts in the large two-story-clear living room. Tickets to the tour are $6.50 in advance or $10 at the door. (Advance sales close a week before the tour.) Admission is on a timed-entry basis every 30 minutes. Photography is allowed anywhere inside and outside the house. Architects can earn continuing education credits for attending the tour if arrangements are made with the American Institute of Architects in advance. To order tickets, select an entry time, get directions to the house, and for additional information, go to www.trianglemodernisthouses.com/tour. Proceeds benefit TMH’s ongoing mission. Call George Smart with any questions: 919-740-8407.